In his fascinating new book Kissinger's Shadow, acclaimed historian Greg Grandin argues that to understand the crisis of contemporary America--its never-ending wars abroad and political polarization at home--we have to understand Henry Kissinger. 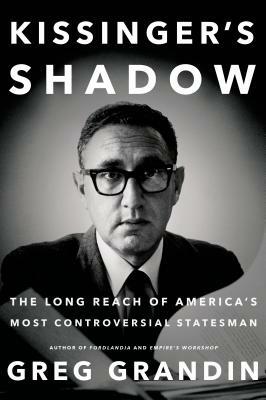 Examining Kissinger's own writings, as well as a wealth of newly declassified documents, Grandin reveals how Richard Nixon's top foreign policy advisor, even as he was presiding over defeat in Vietnam and a disastrous, secret, and illegal war in Cambodia, was helping to revive a militarized version of American exceptionalism centered on an imperial presidency. Believing that reality could be bent to his will, insisting that intuition is more important in determining policy than hard facts, and vowing that past mistakes should never hinder future bold action, Kissinger anticipated, even enabled, the ascendance of the neoconservative idealists who took America into crippling wars in Afghanistan and Iraq. Greg Grandin is the author of The Empire of Necessity; Fordlandia, which was a finalist for the Pulitzer Prize and the National Book Award; as well as Empire's Workshop and The Blood of Guatemala. A professor of history at New York University and a recipient of fellowships from the Guggenheim Foundation and the New York Public Library, Grandin has served on the UN Truth Commission investigating the Guatemalan Civil War and has written for the Los Angeles Times, The Nation, & The New York Times.